Home › National List › Help The National List Go Green! Help The National List Go Green! The National List is making an effort to “Go Green,” and you can help! 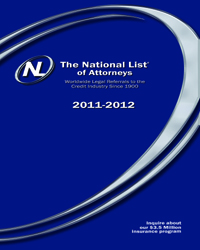 The 2012 – 2013 Directory will be mailed in August, but only to those who specifically request one. All of the printed information in the Directory and more is currently online and is updated daily. If you are using only our website and see no reason to have a “hard” copy of the NL Directory, then you will be able to help us “Save the Planet” by using the electronically available information rather than the printed resources. If you use, display or keep on file a printed copy of The National List of Attorneys Directory, you need to pre-order your free printed copy of the Directory in order to ensure that you receive one in the mail. Click here and you will be taken to a form to fill out. Enter your contact information, click on “Yes. Reserve my copy today!” and Submit. Be sure to do so before the deadline of Tuesday, May 15th. *Don’t let us go to Spam! Make sure the email results@nationallist.com and the domain name @nationallist.com are on your Safe Sender list; otherwise, emails from The National List of Attorneys may end up in your Spam folder or be deleted by mistake.